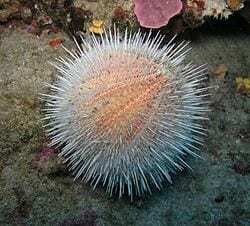 Home Innovation Could the humble sea urchin hold the key to carbon capture? The discovery that sea urchins use Nickel particles to harness carbon dioxide from the sea could be the key to capturing tonnes of CO2 from the atmosphere. Experts at Newcastle University, UK, have discovered that in the presence of a Nickel catalyst, CO2 can be converted rapidly and cheaply into the harmless, solid mineral, calcium carbonate. This discovery, which is published today in the academic journal Catalysis Science & Technology, has the potential to revolutionise the way we capture and store carbon enabling us to significantly reduce CO2 emissions – the key greenhouse gas responsible for climate change. “We had set out to understand in detail the carbonic acid reaction – which is what happens when CO2 reacts with water – and needed a catalyst to speed up the process,” she explains. At the moment, pilot studies for Carbon Capture and Storage (CCS) systems propose the removal of CO2 by pumping it into holes deep underground. However, this is a costly and difficult process and carries with it a long term risk of the gas leaking back out – possibly many miles away from the original downward source. “One way to do this is to use an enzyme called carbonic anhydrase,” explains Gaurav Bhaduri, lead author on the paper and a PhD student in the University’s School of Chemical Engineering and Advanced Materials.